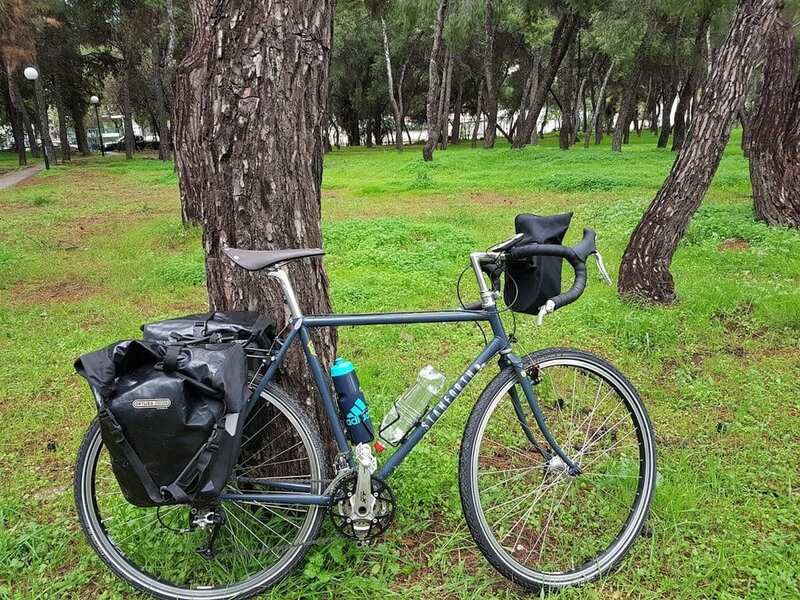 I recently completed a 2 day bike tour around Athens, cycling to Sounion and back. 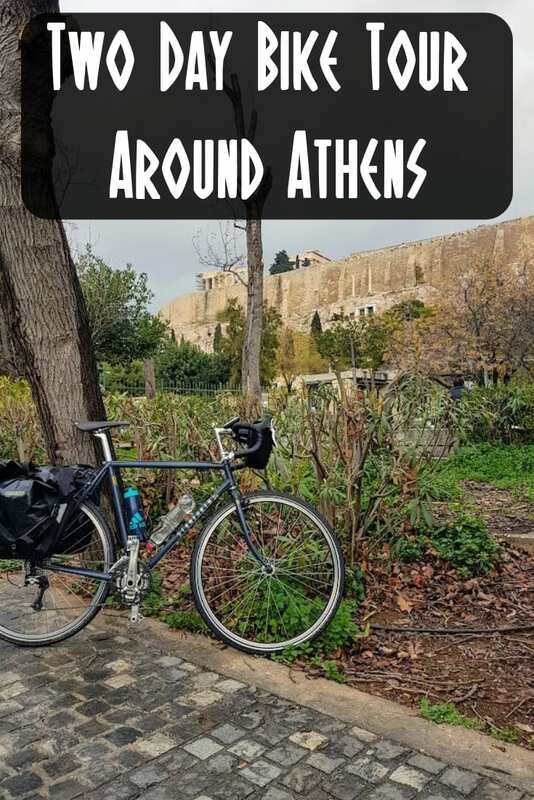 If you are thinking of cycling in Athens or want to follow the same 2 day Athens bike tour, you'll hopefully find this information of some help. I've included videos I made on the bike tour around Athens, thoughts on cycling in the city, and even news of a cycling path! At the beginning of 2018, I set myself a goal of completing at least 3 mini-bike tours, as well as a month long cycle tour. 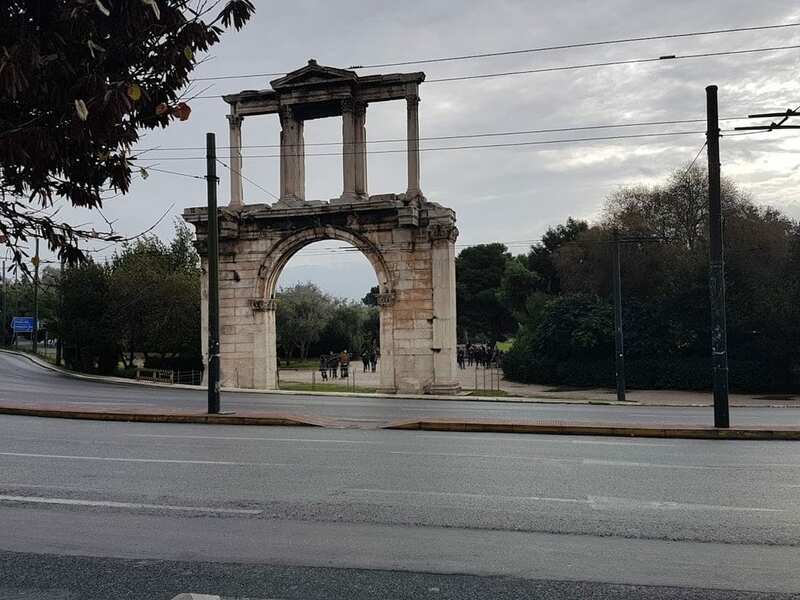 Although the February weather in Athens can be changeable, I wanted to get the first tour completed as early as possible. With this in mind, I decide that I would cycle from Athens to Sounion and back on a loop route. Along the way, I could stop off at a few historic sites, as well as develop my bike touring fitness. The last bicycle tour was back in August 2017, so it would feel good to get back into the swing of things again! 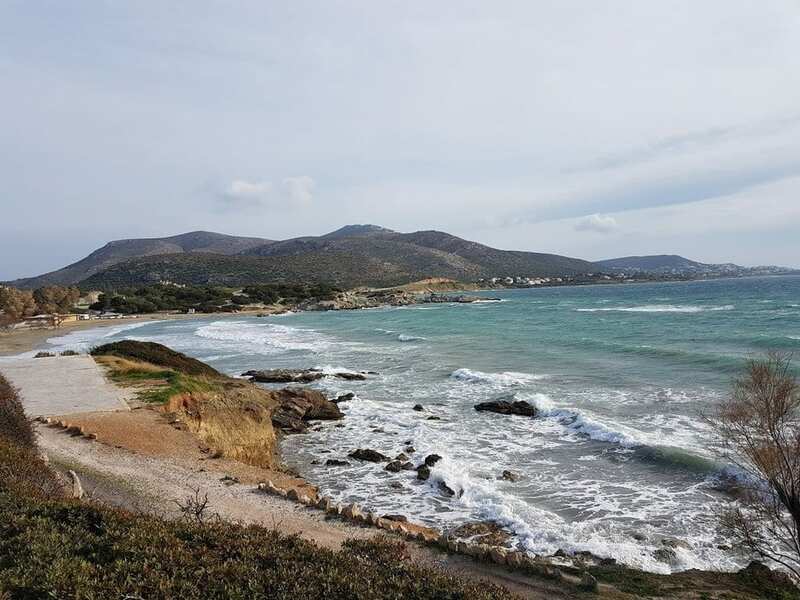 The first day of cycling would take me from my home in Athens to the historic centre, then down to the coast, and finally to an area near Cape Sounion. As with most of my recent bike tours, I made a video of this first day. Underneath, I've written some of the highlights of the days' bike ride. Now, it must be said that cycling in Athens is not for everyone! A near total absence of any meaningful cycling infrastructure has led to very few locals using bicycles as a means of transport. As a result, most people consider cycling in Athens to be crazy, and they may have a point! Hopefully one day, they can take some inspiration from their neighbours such as Albania, where in Tirana for example, there is a cycling culture developing thanks to the introduction of bike lanes and cycle paths. Until that time though, it is what it is! My route from where I live to the historic centre is about 7kms. Leaving reasonably early on a Saturday morning, there wasn't too much traffic, and I soon found myself at Syntagma Square. As you can see from the photo, it had rained a few hours before. Whilst a grey sky would accompany me for the next two days, I was spared any rain though! 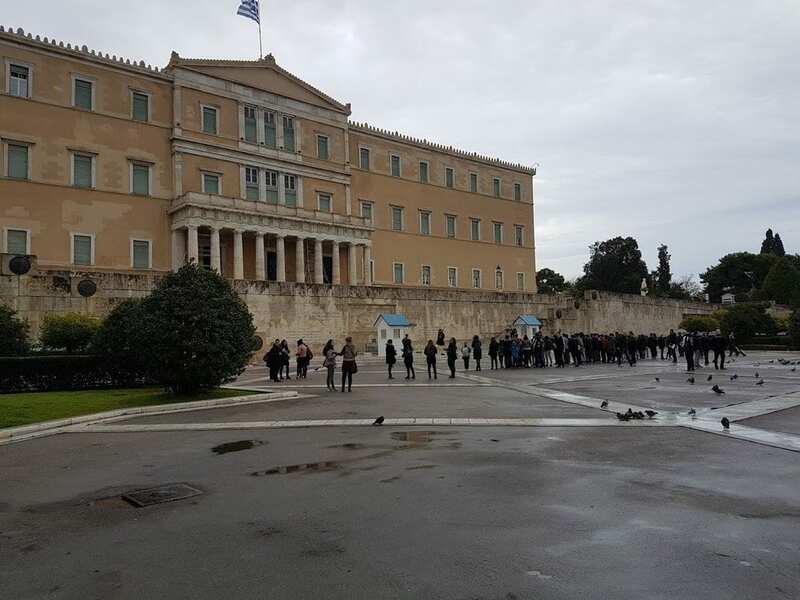 I just caught the tail-end of the Changing of the Guard ceremony in Athens. I've seen it a number of times before, and I would certainly recommend that first time visitors include it on their list of things to see in Athens. From Syntagma Square, I then cycled down the hill to Hadrian's Arch and the Temple of Zeus. I've also visited the Temple of Zeus before, and so didn't enter the site on this occasion. Once I had taken my photo of Hadrian's Arch in Athens, I then entered the pedestrianised area which circles around the Acropolis. Possibly the single biggest modern urban development in Athens that has helped enhance lives of locals and tourists alike, is a pedestrianised area that circles the Acropolis. Although technically it is three different streets, for the sake of simplicity, I will call it Areopagitou. This is a place for locals to come for a ‘volta', or leisurely walk, with Sunday being particularly popular. Early on a Saturday morning in February, the street was virtually empty of people. This meant that there were some great unhurried views of the Acropolis along the way! I think the Stanforth Skyelander looks great in front of the Acropolis! My next stop, was to look over the Kerameikos archaeological site. This is one of the lesser visited sites in Athens, as admittedly it doesn't look as spectacular as the Acropolis or the Agora. Spending a little time and using a little more imagination though is rewarding in that it helps to build up a picture of what the city of Athens must have looked back in its glory days. 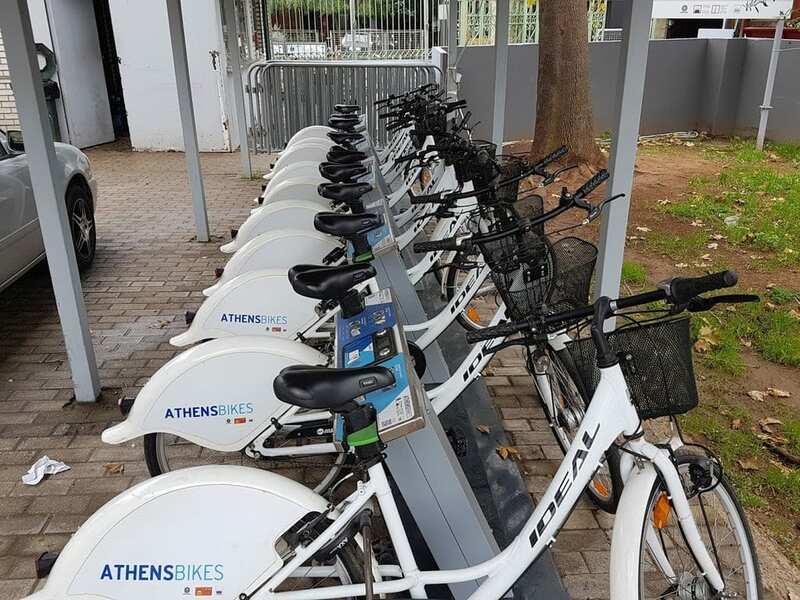 Technopolis – There's a bike hire scheme there! It's always nice to be pleasantly surprised, and so I was when I stopped by Technopolis. This re-purposed gasworks is now an industrial museum, function centre and home to the central Athens bike share scheme. Yes, you heard it right, Athens has a bike share scheme! Now, there are probably many reasons that people don't know much about the Athens bike share scheme, with the main one being no-one knows it's actually there! Tourists are unlikely to stumble upon it by accident, and it doesn't feature prominently in tourism leaflets. Still, I'm determined to do my part, and hope to both use the scheme and share my experiences of it in the very near future! Is this a bike lane I see before me? And then it was on to the second surprise of the day – a bike lane! I had previously only seen a part of this welcome new addition to the Athens infrastructure before, but now I could follow its entire course. Running from just near Technopolis it ends (rather abruptly) at Faliro on the coast. 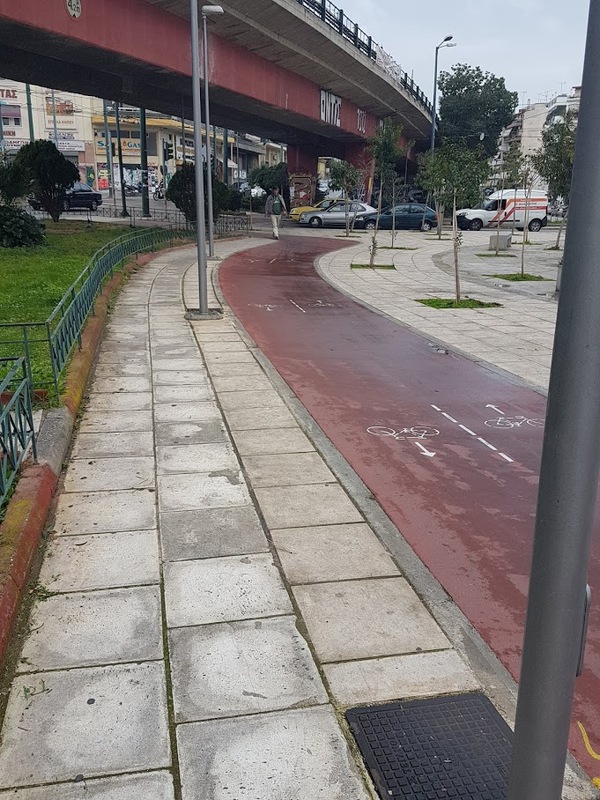 Sure, pedestrians hadn't quite got the hang of cyclists using a cycle lane, and of course, there was the occasional moped using it, but well done Athens. A step in the right direction I think! 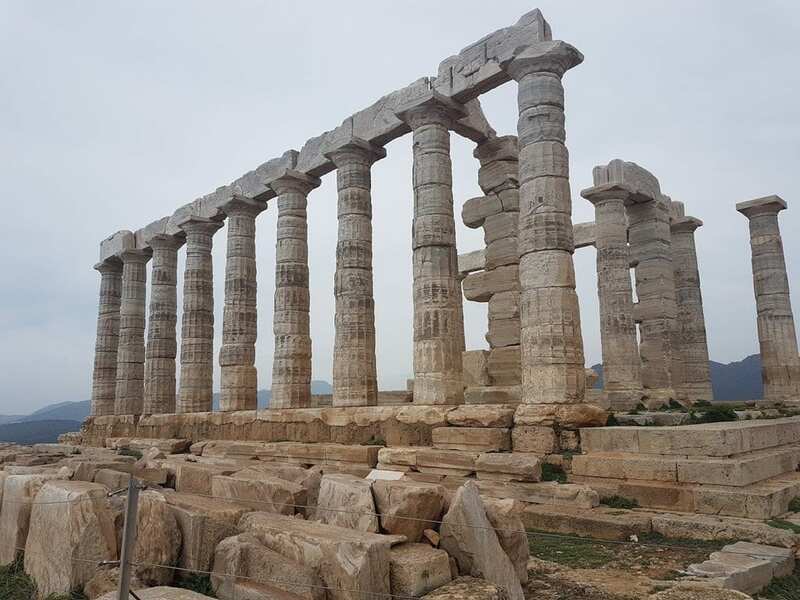 Whilst most people head to the Temple of Poseidon at Sounion to see the sunset, I knew that it would be unlikely I could see it at that time and then find somewhere to stay. Instead, I had booked a room at a small settlement called Charakas a few kilometres short. There was still a fair distance to pedal from Faliro first though! Along the way between Faliro and Gylfada, there was a bike path (of sorts), which kept me off the main roads. After that, it was just a matter of following the coastal route until I reached the village. With 77km total cycled for the day, I arrived at my place in Charakas and stayed the night. After a good night's sleep, it was time to hit the road again. Today, my destination was first the Temple of Zeus at Cape Sounion. After spending some time there, I would then cycle through Lavrio and then back to Athens, completing a loop. You can see my video from the day's bike ride below. When I arrived at the site, I found that entrance was free for the day. (Possibly because it was the first Sunday of the month in the winter, when many sites have free access). There were also very few other people there, so I was able to spend quite a lot of undisturbed time at the Temple of Poseidon. On leaving the Temple of Poseidon there really isn't much more to tell. I cycled through Lavrio, and then hit a long stretch of dual-lane road, which whilst uninspiring did have a very nice shoulder to cycle on. The total kilometres for the day was 68kms. 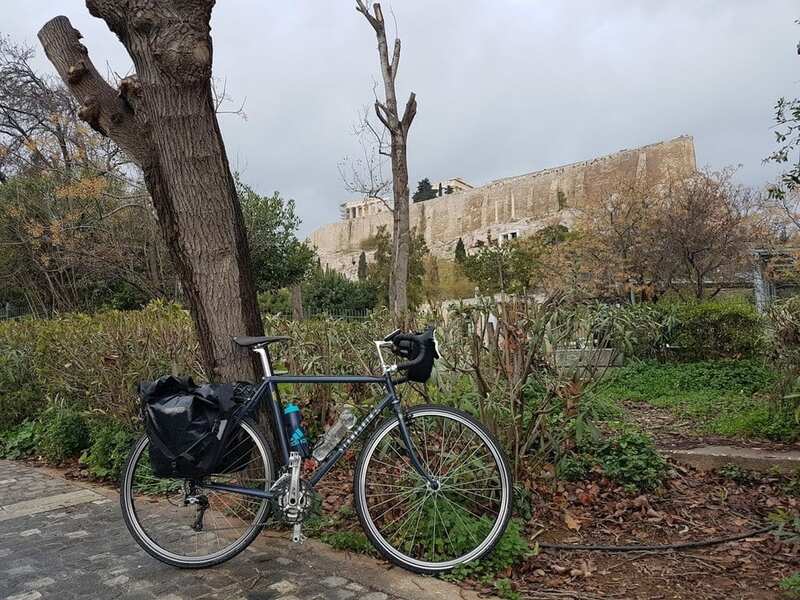 As mentioned, Athens is not a very cycling friendly city, however the route I took was about as good as it gets when it comes to keeping away from heavy traffic. Bar a few sections of road both getting into the historic centre of Athens, and then a few stretches along the coastline, the roads were reasonably quiet and a pleasure to cycle. This was a nice 2 day cycling trip, and one I would recommend for any visitors on a bike tour who want to do do a little cycling around Athens. If you're planning on cycling in Athens, and want any advice, leave a comment below and I'll do my best to answer your questions! This is short notice but we are arriving in Athens on Tuesday, March 27 with 2 touring bicycles at the international airport. We only have 8 km to our AirBnB — any suggestions about traffic from the airport? Crazy traffic on big roads? We’re on our way Nordkapp, Norway – expecting to arrive there in September. We do have a lot long distance bicycling experience. Damn – forgot to answer this, but I think I replied via email? The short answer – yes you can cycle back from the Athens airport to the center. The roads are busy but not too crazy – The craziness really only happens when you reach the centre of the city.